Gussied-up street food is all the rage these days, and one offshoot of this trend is a renewed interest in that humblest staple of Asian holes-in-the-wall: the rice bowl. 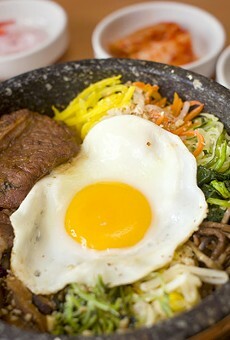 Korean cuisine's signature rice bowl is the bibimbap: basically a bowl of rice topped with sautéed vegetables, a fried egg, chili pepper paste, and, often, some kind of sliced meat. In the East Bay, Albany's newly opened Bowl'd is executing variations on this classic at such a high level, no one else is even close. The flavors are brighter; the vegetables taste fresher and are cooked to perfection. Here, customization is the name of the game: You pick the kind of rice you want, the type of protein (thin-sliced beef, spicy pork, short ribs, etc. ), and so forth. We recommend the "Sizzling Rock" bibimbap, which comes in a hot stone bowl and leaves you with wonderfully crispy bits at the bottom of the bowl, especially if you opt for white rice.